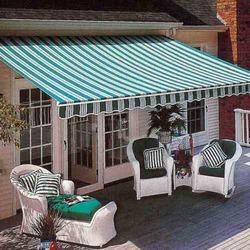 We are an incomparable name in offering a superior quality Terrace Awnings. This terrace awning is accessible in various specifications within a given time period. Our provided terrace awning is inspected on quality provisions in order to assure its flawlessness. As well, this terrace awning is manufactured by using top most quality material and latest techniques keeping in mind the set standard of industry. Since its inception in 1994, Shashank Enterprises is a well known firm engaged in manufacturing and supplying a large variety of Office Files and Folders and Plastic Report Files. To meet the varied demands of our customers we also supply items like Plastic Report Files, Cobra Files, Laminated Office Files, Ring Files, Office Files, Executive Files, Index Files, Ripple Files, Office Folders, Leather Office Folders, Jute Office Folders and Cobra File Folders. These items are highly praised in the industry owing to its optimum quality, affordable prices and superior finish. To add to it, our items are made with the help of best grade raw components and superior technique that is procured from reliable sellers of industry.